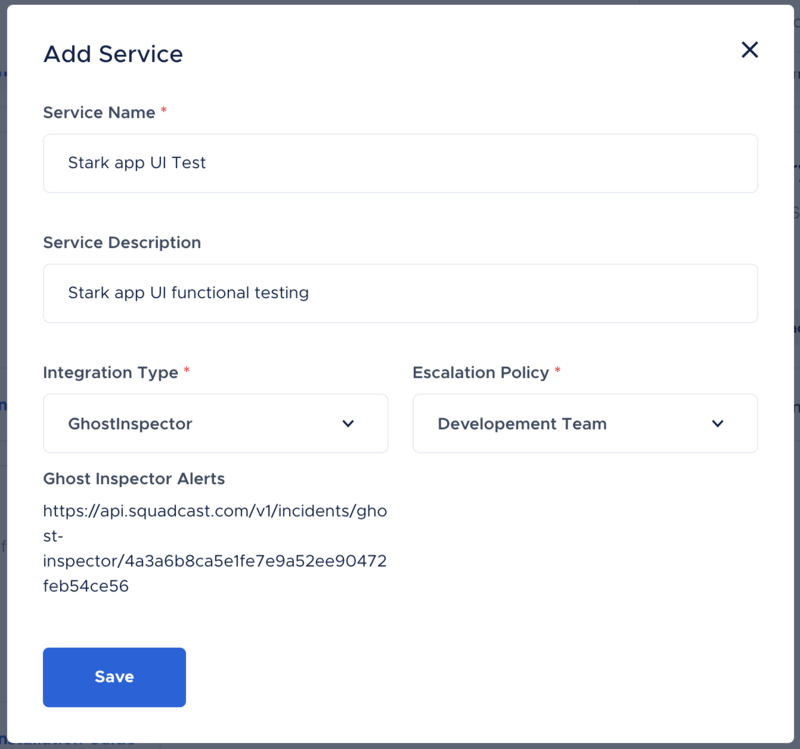 Follow the steps below to configure a Ghost Inspector service so an alert can be triggered whenever a UI test fails. Squadcast will then process this information to create incidents for this service as per your preferences. You can either navigate to an existing service or make a new one by clicking on Add Service. From the integration types dropdown, select the integration type as Ghost Inspector. You will be shown your Ghost Inspector Integration Webhook URL. Enter the service name and description as required and click on the Save button to create the service. Now login to you Ghost Inspector dashboard and click on the profile icon at the top right corner and select Account Settings from the resulting options. Select Notifications panel from the account settings. In the notifications window, under Webhooks, choose Yes for Enabled and add the webhook URL from above and make sure Frequency is selected as Send once if the test fails, then once when it passes again, so the alerts can be Auto-Resolved in Squadcast when the test passes again. Go to your test suite settings and select the Notifications tab and make sure webhooks has Use Organizational settings enabled. Also, make sure that Use Suite settings is enabled for webhooks in individual test settings. Alternatively, you can also choose to use different webhook URL's for different suites or tests and configure them to different services in Squadcast based on requirement. The Ghost Inspector integration is good to go and if there are any failed UI tests, it will automatically trigger an incident in Squadcast and if the test passes again, the incident will get Auto-Resolved in Squadcast.